GN Solids Control manufacture equipment for Oil Gas drilling mud solids control system,HDD(Horizontal Directional Drilling) mud reycling System,mining and industrial slurry sepration.GN Solids Control system are wildly used for both onshore and offshore oilfield drilling rig,HDD drilling rig. Shale Shaker, Mud Cleaner ,Desander ,Desilter, Centrifuge, Agitator, Mixing Hoppers, Flare Igniter, Mud Tanks, Pumps, Degassers for sale. What is TBM Slurry separation system? GN solids control produced various kinds of mud tanks for oilfield drilling and water well drilling, including swab tank, storage tank, fuel tank, water tank, mixing tank, suction tank, pill tank, trip tank, mixing tank, intermediate tank, shaker tank etc. 2. Sand Blast Treatment before painting. 4. Two Pack Epoxy hi-build containing anticorrosive pigmentstwice. Also called test tank, each plumbed for separate discharge to vacuum truck or water tank. Complete with minimum 32 ” Poor-Boy Degasser with proper vent, fluid leg and inspection hatch. Usually we will provide a complete sets of measurement tools, including Mud Balance, Plastic Marsh Funnel Viscometer and Plastic Measuring Cup and Stopwatch. 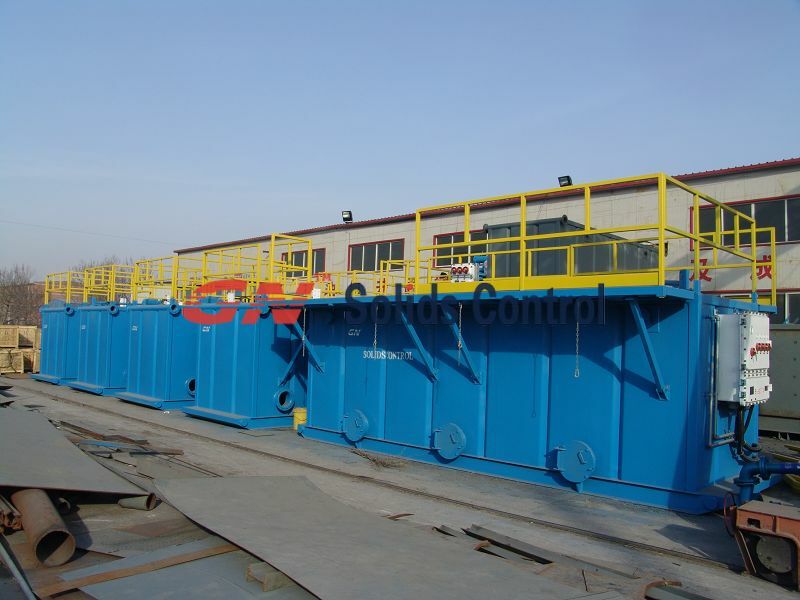 A small mud tank with a capacity of 10 to 15 barrels, usually with 1-barrel or h-barrel divisions, used to ascertain the amount of mud necessary to keep the wellbore full with the exact amount of mud that is displaced by drill pipe. When the bit comes out of the hole, a volume of mud equal to that which the drill pipe occupied while in the hole must be pumped into the hole to replace the pipe. when the bit goes back in the hole, the drill pipe displaces a certain amount of mud, and a trip tank can be used again to keep track of this volume. A fuel tank is safe container for flammable fluids. Though any storage tank for fuel may be so called, the term is typically applied to part of an engine system in which the fuel is stored and propelled or released into an engine. We manufactured hundreds of mud tanks every year, welcome to contact GN solids control for further information.